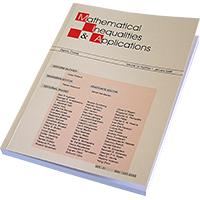 'Mathematical Inequalities & Applications' ('MIA') brings together original research papers in all areas of mathematics, provided they are concerned with inequalities or their role. From time to time 'MIA' will publish invited survey articles. Short notes with interesting results or open problems will also be accepted. 'MIA' is published quarterly, in January, April, July, and October. Manuscripts should be submitted electronically in PostScript or Adobe Acrobat PDF format to the 'MIA' Editorial Office through the provided web interface. The author who submitted the article for publication will be denoted as a corresponding author. He/She manages all communication and correspondence with the 'MIA' regarding the article. Authors may indicate a member of the Editorial Board whom they consider appropriate for the article. However, assignment to that particular editor is not assured. In order to facilitate refereeing, copies of those papers (whether by the author or someone else) which are essential and referred to in the manuscript but are not conveniently accessible, should be enclosed. In order to submit a manuscript, you first need to login to the Ele-Math.com website. If you do not have an account you can create one by clicking here. The acceptance of the article automatically implies the copyright transfer to 'MIA'. Manuscripts are accepted for review with the understanding that the same work has not been published (except in the form of an abstract), that it is not under consideration for publication elsewhere, that it will not be submitted to another journal, and that its submission for publication has been approved by all the authors. Download the style package here. On acceptance of the paper, authors will be asked to send file(s) by e-mail to the Editorial Office. Title page On the title page author should include the title of the article, author's name (no degrees), author's affiliation, e-mail addresses, mailing address of the corresponding author and running head less than 60 characters. Abstract, Keywords The manuscript must be accompanied by a brief abstract, no longer than 100-150 words. It should make minimal use of mathematical symbols and displayed formulas. Subject Classification Mathematics Subject Classification (2000) with primary (and secondary) subject classification codes and a list of 4-5 key words must be given. Figures Figures should be prepared in a digital form suitable for direct reproduction, grey scale only, preferrably at resolution of 300 dpi or higher, sized to fit a journal page, and in EPS, TIFF or JPEG format. Figures should have a short descriptive title and should be numbered consecutively in order of appearence in the text. The position of each figure in the text should be indicated. References Bibliographic references should be listed alphabetically at the end of the article. The author should consult Mathematical Reviews for the standard abbreviations of journal names. The author will receive proofs only once. Late return of the proofs will delay the article to a later issue. There are no page charges. Authors will receive PDF file of the printed article free of charge. Additional offprints may be ordered from 'MIA' prior to publication. 'MIA' is published by Publishing House Element d.o.o., Zagreb, Croatia. The publication of this journal is supported by Ministry of science, education and sports, Croatia.